Speakers at the event described programs that help pregnant mothers suffering from addiction to have healthy pregnancies and deliver babies who are substance free and that help to address patients’ needs for housing and food – all interventions made possible by the ACA and which are helping to improve health and thus lower health care costs. 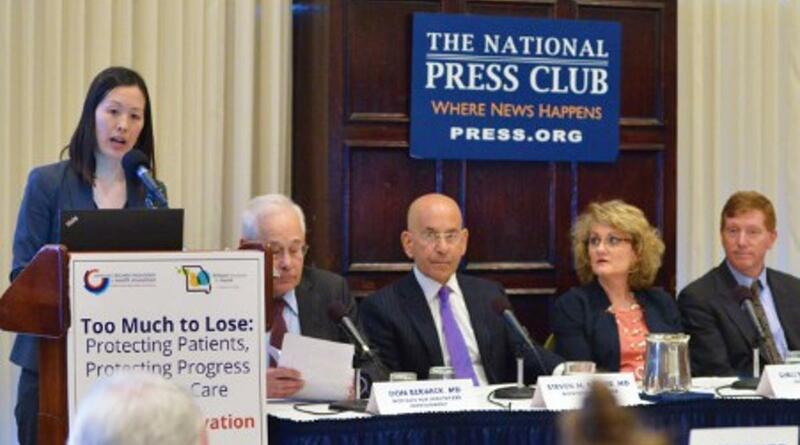 The leaders reflected on the ways that Medicaid coverage and the ACA have enabled progress at their institutions, from dramatically increasing the numbers of insured individuals (585,000 Medicaid patients at Dignity Health alone) to improving their financial ability to make investments in programs that connect parents with substance use disorders to behavioral health services. We were gratified to see so many prominent leaders step forward to share how their institutions have been working to improve care and health thanks to the coverage and innovation initiatives under the Affordable Care Act. With the introduction of the House Republicans’ ACA repeal bill , which also imposes sharp cuts on all Medicaid programs, we know we’ll need these voices of leadership more than ever in the fight to ensure that we protect progress, protect innovation and protect the patients that we all care for. What are your concerns about the GOP repeal legislation? What innovation are you scared of losing? Tweet us @CCEHI with the hashtag #ProtectInnovation and let us know.